One of the most beautiful things about urban hiking in Denver is that we have not one, but TWO, national wildlife refuges to escape to for a beautiful plains-oriented hike. 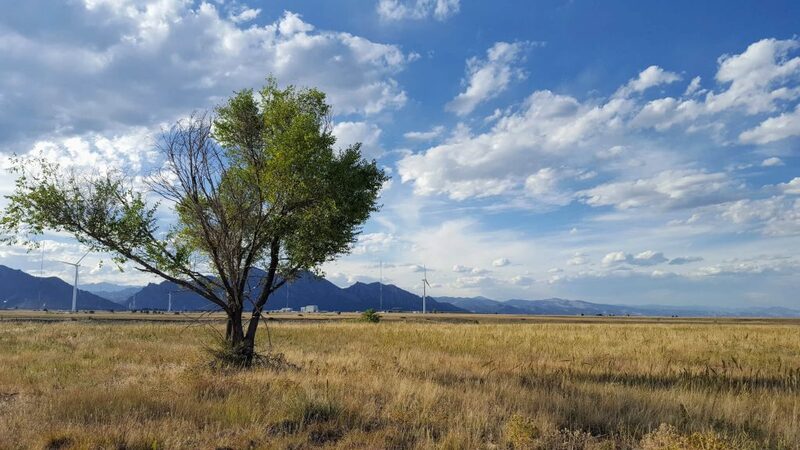 The older Rocky Mountain Arsenal Wildlife Refuge is on the Denver boundary next to Commerce City, and the newer Rocky Flats Wildlife Refuge sits just north of Denver and east of Broomfield. The Refuge’s main entrance is located at mile marker 3 on the south side of Highway 128. Both the refuges have similar histories–they resulted from the cleanup of armament development. The Arsenal manufactured petro-bombs, sarin and mustard gas along with pesticides from the 1940s through the 1970s. Rocky Flats took on plutonium triggers for the nuclear arms race. After closing both arms factories, the areas were cleaned up (with much controversy) with Superfund money and opened as wildlife refuges. With similar geology and geography, you’ll find wide-open prairies, rolling hills, historic buildings and vast views. Whereas the Arsenal has bison, Rocky Flats has elk! 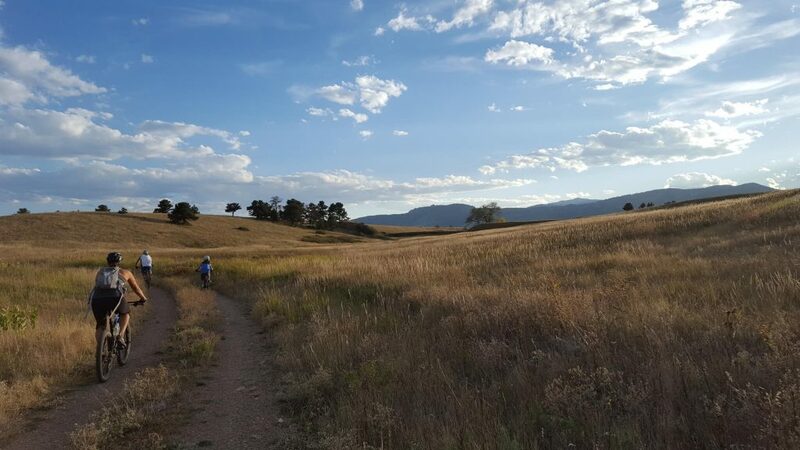 The Rocky Flats trails are previous dirt roads of double track with a raised grassy area between the two tracks. From the northern parking lot, they start as just dirt and then turn to pea gravel and then gravel. Due to the rough surface, you’ll want to wear sturdy shoes. There are over 10 miles of trails, of which mountain bikers will also find great adventure, and whom should yield to hikers. 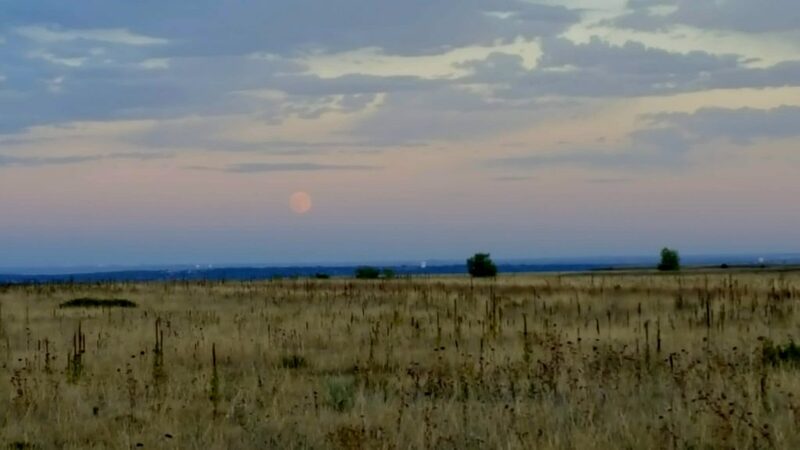 On September 23, we headed out to Rocky Flats to see the full moon rise. The gates technically close at sunset, so we arrived early to hike and catch the moon rise at the end of the hike. We headed out from the northern parking lot for a 6-mile out and back hike. Start at the Walnut Creek trail head off Highway 128. At the trail head, you’ll find a compost toilet, maps, and general information. Please note that no dogs are allowed, but horses are permitted. Make sure you have plenty of water. Not only is it dry, but the altitude might add additional challenge for those hikers arriving from outside of Colorado. Head westerly for about two miles to the Lindsay Ranch Loop. You’ll go down in the ravine and have gorgeous homestead views along Rock Creek. 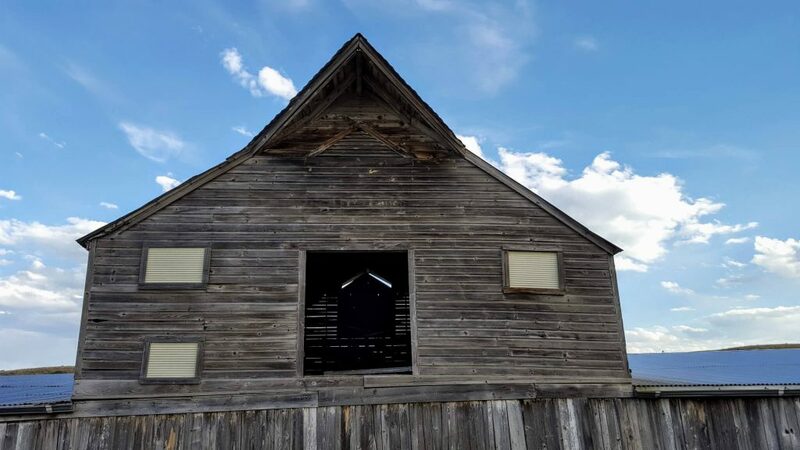 Continue around the loop, enjoying the old Scott homestead and barn where the Lindsay family raised cattle until they were asked to move by the atomic commission in the 1940s. Here is a good chance to see many of the 239 migratory and resident wildlife species including prairie falcon, mule and white-tailed deer, elk, coyotes, songbirds, hawks, and the federally threatened Preble’s meadow jumping mouse. 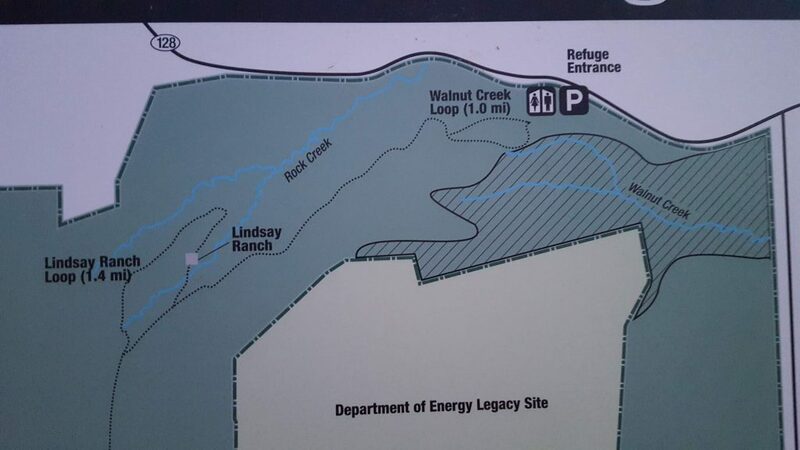 Exit the loop and return to the Walnut Creek trail by turning to the east. Follow it back to the trail head on Highway 128. When you arrive back at where you parked, you will have walked just a bit over 6 miles. We only touched the northern portion of Rocky Flats. We’ll be back to enter from the southern entrance to adventure along Rocky Mountain Greenway, which will eventually connect Rocky Flats to Two Lakes to Rocky Mountain Arsenal. The ultimate goal is to connect all three Refuges with Rocky Mountain National Park. I can’t wait! What did you enjoy on your Rocky Flats hike? 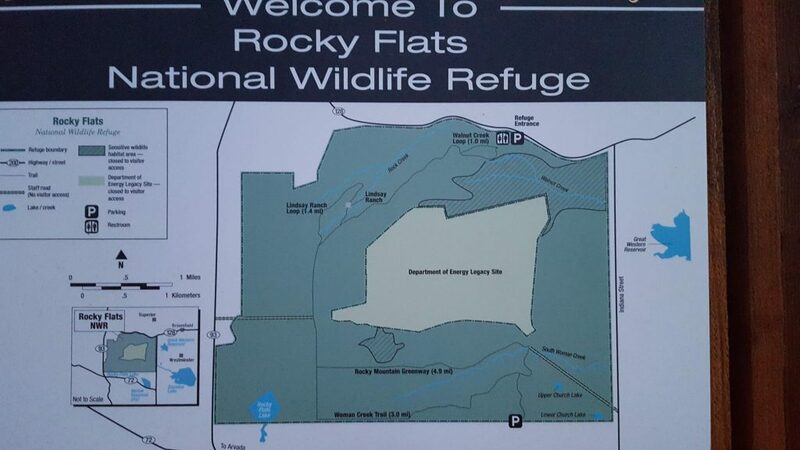 Post pictures and tell me why you hiked Rocky Flats National Wildlife Refuge.